Our scholarships programme, for which we receive support from a number of charitable trusts including the Stone Family Foundation, has on an average taken from recent years accounted for between 65 and 75 per cent of the Trust’s expenditure. By the same measurement, the Longford Lecture (2014 Lecturer Nils Oberg is pictured above) and the Longford Prize represent between 10 and 12.5 per cent of outgoings. The trust works to keep administration costs as low as possible, while maintaining the professionalism and expertise required to ensure that all funds are directed to those who can best benefit from them. A fuller breakdown is available in our Annual Report. The Longford Lecture is currently sponsored by Unilink Technology Services. The Longford Prize is supported financially by the McGrath Charitable Trust. 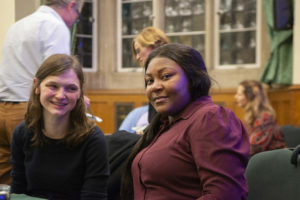 Previous sponsors of our annual lecture, have included the Independent and Telegraph titles, Thames River Capital and Investec Asset Management. Among long-standing supporters are: the Monument Trust (which covers running costs); the Rank Foundation (the Nat Billington Scholarships); the Legal Education Foundation (the Patrick Pakenham Awards); and the Linbury Trust (the Frank Awards).